On a sunny and cool spring-like day in the middle of the winter we headed to the northernmost reaches of Portugal to the Minho River which forms the border with Spain in Melgaço. Looking around at the unspoiled landscape I am reminded of Northern California in late winter when the landscape is green with the small village feel of a satellite Burgundy village. There are small parcels of vines divided in every direction, some with small stone walls, some with rickety old fences. We are here to visit Luis Cerdeira of Quinta do Soalheiro. I believe Luis to be the most forward-thinking visionary in the Vinho Verde region amongst a cadre of ambitious and talented vigneron (Ameal, Mendes). He takes risks with his wines that others do not. The variation of expressions is impressive, with different wine styles and complexities to suit just about every palate. He tinkers with different wine-growing and winemaking concepts that are at the forefront of his craft, many also used by some of the best winemakers in the world. This includes organic, biodynamic and even some “natural” principles. He also is quite hands-off, letting the wines make themselves. The tinkering is never while the wine is being made, it’s the thought process before the wines are being made. Let’s also not forget that all of this is mostly with one grape varietal, the Alvarinho grape. 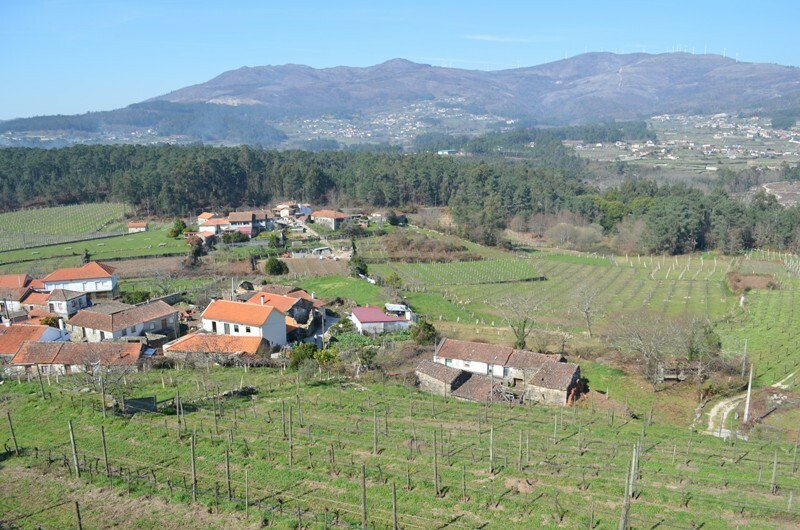 He has the legal option to use other grape varieties, however, like most others in Monção e Melgaço, Alvarinho is the grape and is perfectly suited for this part of Iberia. 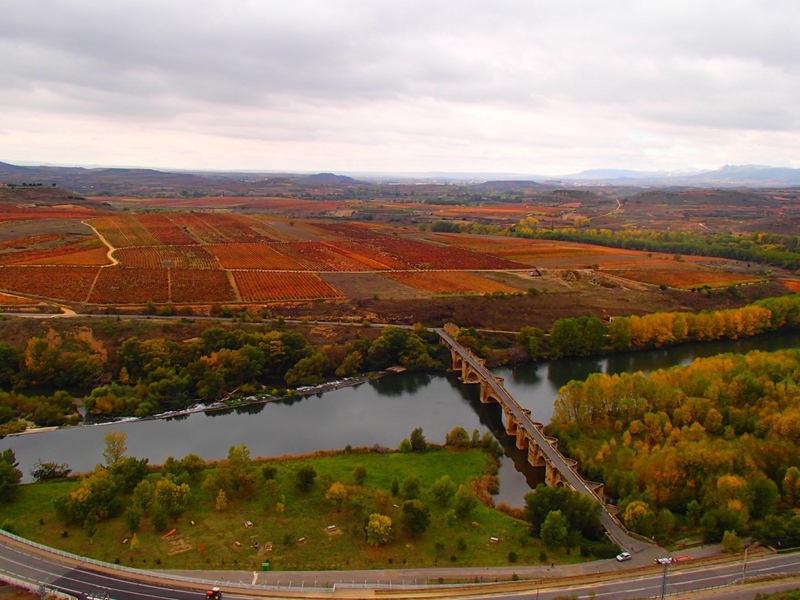 In fact, just over the river is Spain’s Galicia region, the same grape, Albariño, is also the predominant grape variety. What we have here at Soalheiro are pure and original high-quality wines. Between detailed and passionate candor regarding his wines, his growers, or his family, Luis will also throw out a joke or two, usually of the ironic variety. 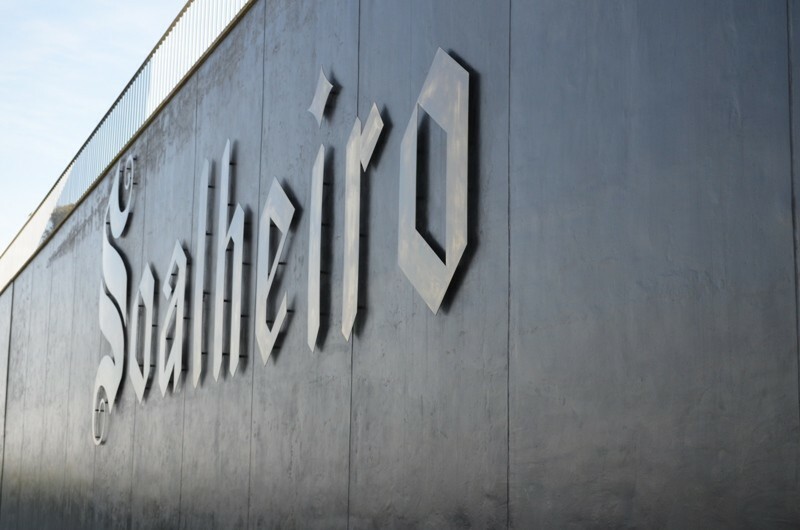 Soalheiro, by European standards, is a very young operation. His father João planted the first vines in Monção e Melgaço in 1974, bottling the first Soalheiro in 1982. 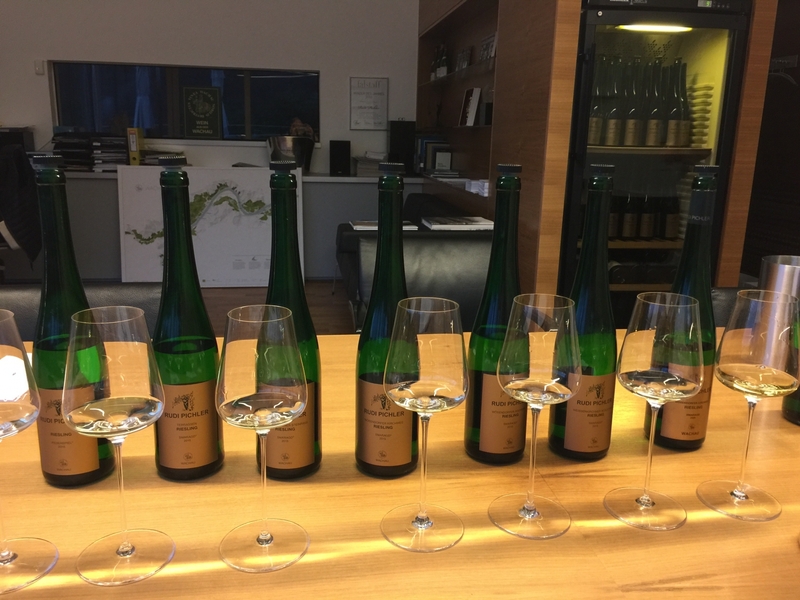 You would not know it from tasting the wines as these are precise and consistent in their high quality and character, but they are relative newcomers in the context of winemaking history. For example, Port wines have been documented to have been made since the 1600s, with winemaking roots that go back even further. Overall, Soalheiro was the 4th wine producer in Vinho Verde, the largest wine DOC of Portugal that is broken down into 9 subregions. We arrived at Soalheiro after about a 90-minute scenic drive from Porto past rolling green hills with small villages at the bottom of the valleys dotted with the typical white-wash paint and red roofs. Watching over it all are towering mountains covered in forest that help regulate the climate by helping block Atlantic weather systems. Soalheiro is nestled on the downslope of a large mountain in its foothills with the Minho River further down the slope at the bottom of the valley. Many of the vineyards face north, allowing for indirect sun contact in a warm climate so you get ideal steady ripening. 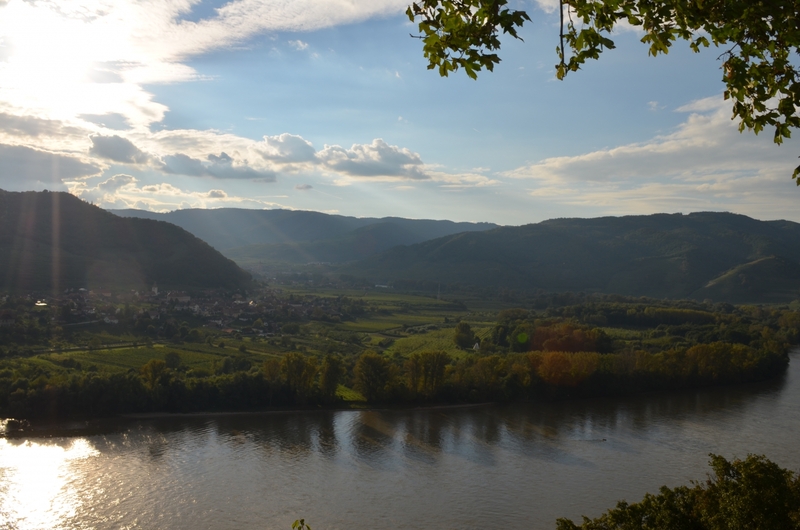 Diurnal temperature differences keep acidity intact, while the Minho river helps regulate temperature extremes. The surrounding mountains help temper weather systems that can bring rain or clouds that could block the sun’s life-giving rays. 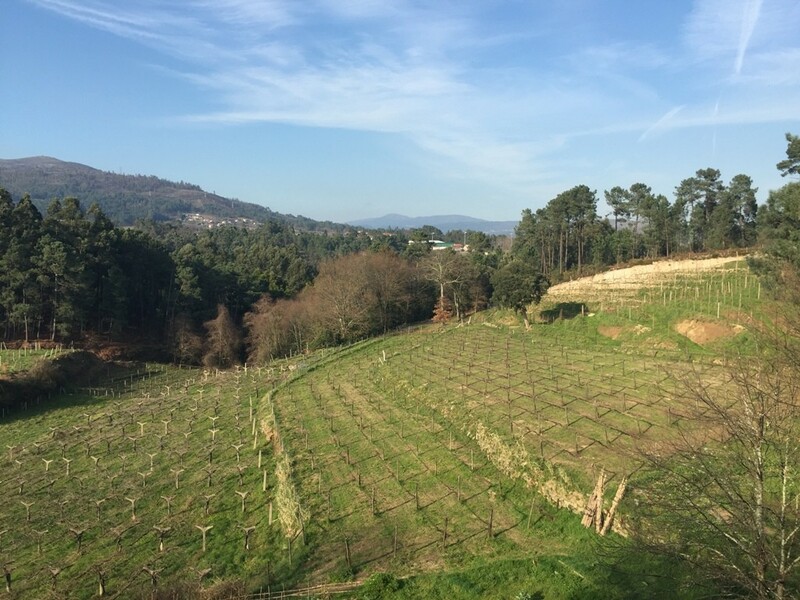 The name Soalheiro literally translates to “sunny” or “sun trap”, and here in Melgaço that is a big part of the terroir, being a “sunny place”. In our group visiting Luis we met several other enthusiastic Soalheiro ambassadors. A wonderful married couple from Poland that operate a Portuguese influenced restaurant. Also among us were a few Spaniards that import Soalheiro. This is something you do not see that often in Europe, except from the most true and passionate wine lovers as most people drink regionally. Not that I needed it, but that to me was a huge endorsement. It really is amazing how wine brings people together from across borders and cultures, it never fails to amaze me. To get things started, Luis started out by telling us about his wine styles and a little history on the region and Soalheiro. He took us through his operations which was important to see all of the different fermentation and aging vessels Soalheiro use to craft the various expressions of wines: steel tanks, a large concrete egg, a large neutral oak tonneau cask, French oak barriques, and slightly larger and a few elongated chestnut wood barrique. We tasted the wines directly from the steel tank, tonneau and concrete egg that were the new 2016 vintage soon to be bottled. Luis talked us through the differences in color, aroma, flavor, texture and acid intensity resulting from the different vessels used to ferment and age the wine. The differences were apparent and telling of the kind of vessel used. 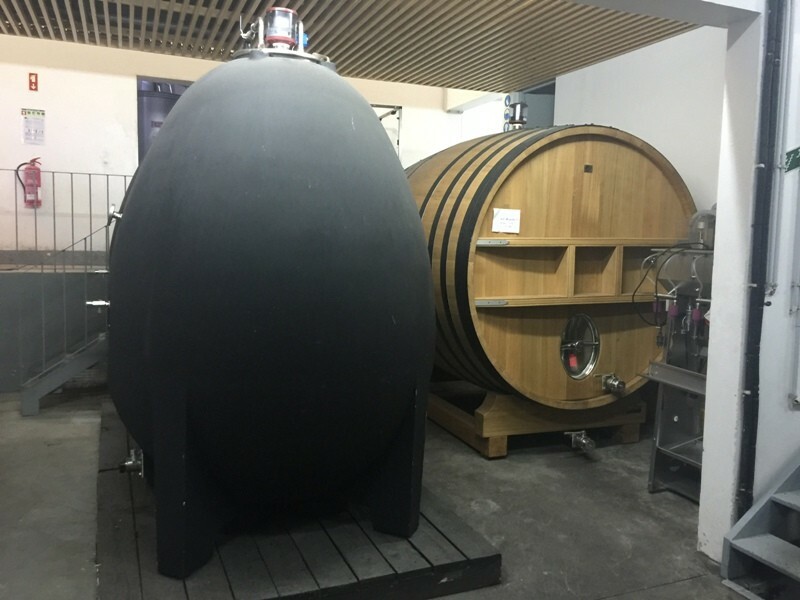 The concrete egg wine had a vibrant yellow color, a dense and slightly reduced nose with a rounder, weightier feel with lower perceptible acidity and pure orchard white and stone tree fruits. 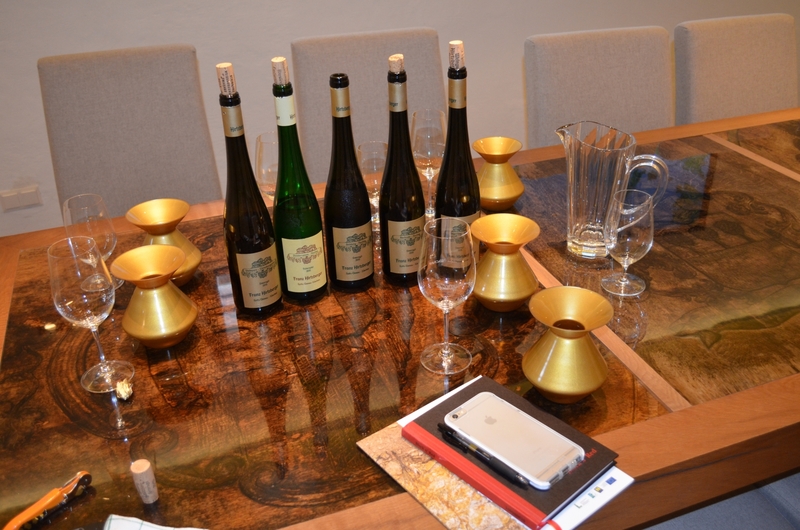 The tonneau wine had a deeper yellow color, with an immediately more expressive and tense minerally nose, while the palate had a lighter texture that was broader with more perceptible acidity and a more linear feel. 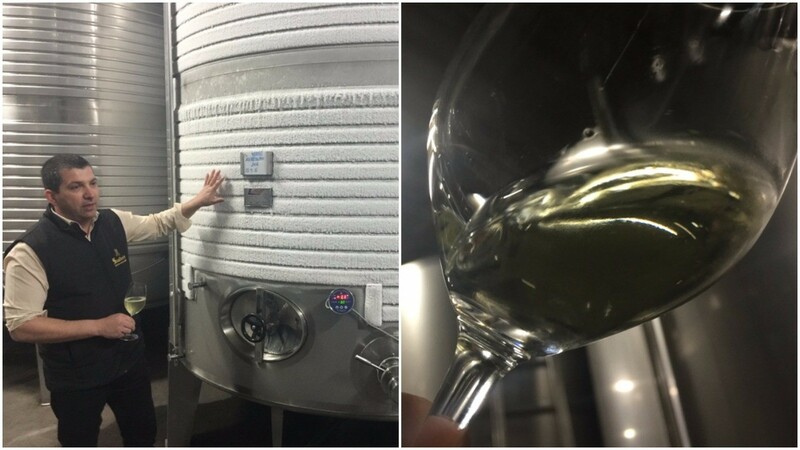 The steel tank wine had a vibrant yellow core with a green hue. The nose was intensely fresh with citrus, pear, peach, and a cooling mineral streak, while the palate continued with a fresh and focused density of flavor, minerality and texture wrapped with verve and racy acidity. Remember, these were just the tank samples. We did not even get to the bottled wines yet. 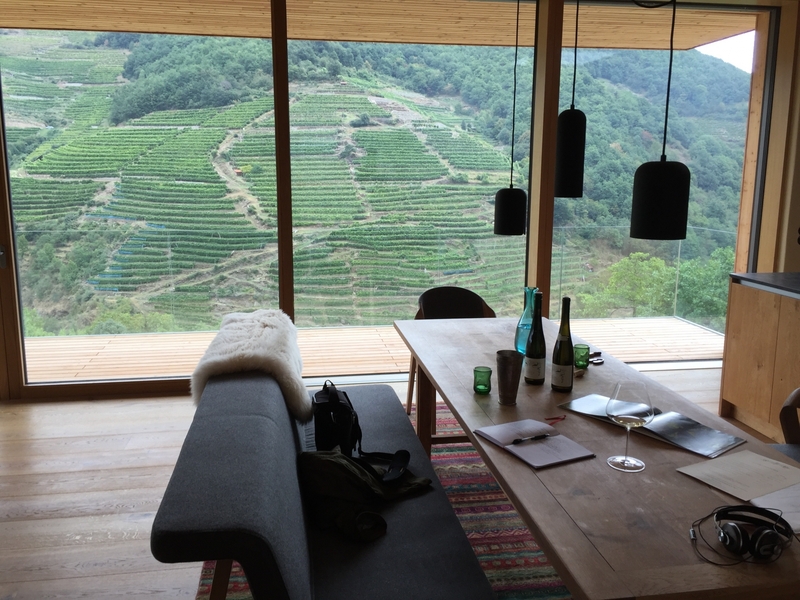 We headed upstairs to taste the bottled wines at a large square tasting table that overlooked the valley and river below us. The light was perfect to gauge wine clarity and color. 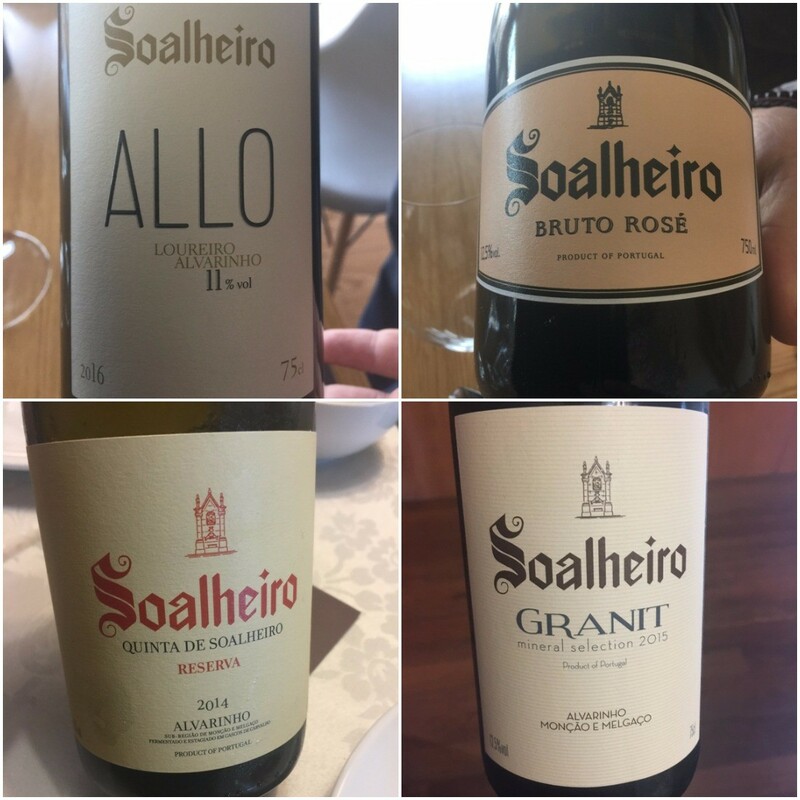 The diverse set of wines on the table allowed us to compare and contrast at once the different styles of Soalheiro wines. We started with an 11-year-old Primeiras Vinhas, meaning “first vines”, thus old vines, as they are 30+ years old – the same vines mentioned earlier planted in 1974. This 2006 vintage was the first vintage of Primeiras Vinhas. Gold in color, the 2006 showed maturity in that hue, with tertiary notes in the nose and palate, excellent complexity and balance of primary and secondary notes on the palate. 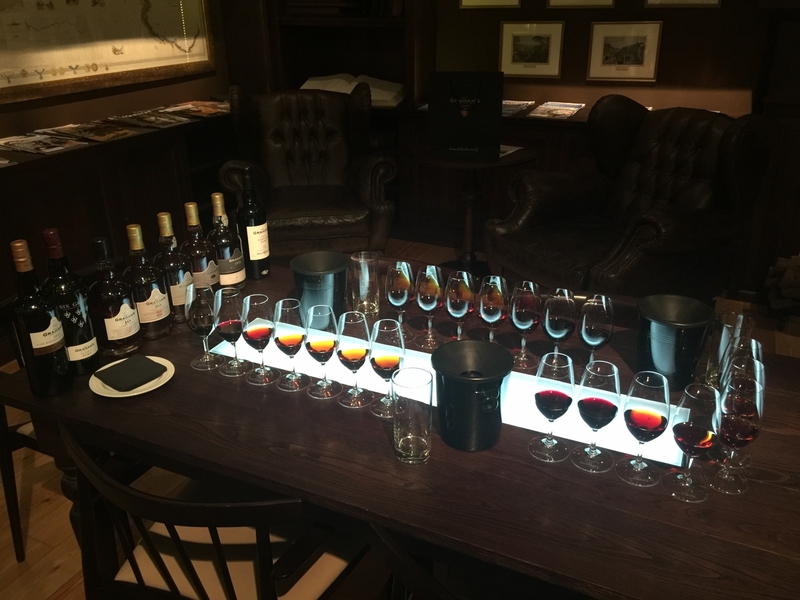 We then tasted the 2015 Primeiras Vinhas which was also outstanding. Young, intense and vibrant with energy, the 2015 showed similarities to the 2006 and allowed you to conceptualize how the 2006 got to where it is now. Next was the rose sparkling wine, Espumante Bruto Rosé 2013, a savory and fresh wine tinted pink with Touring Nacional made in the traditional Champagne method and seeing some malolactic fermentation to the base wine. Berries and citrus galore, this is made in the traditional Champagne method. Following that up was the workhorse, 2016 Alvarinho Soalheiro. 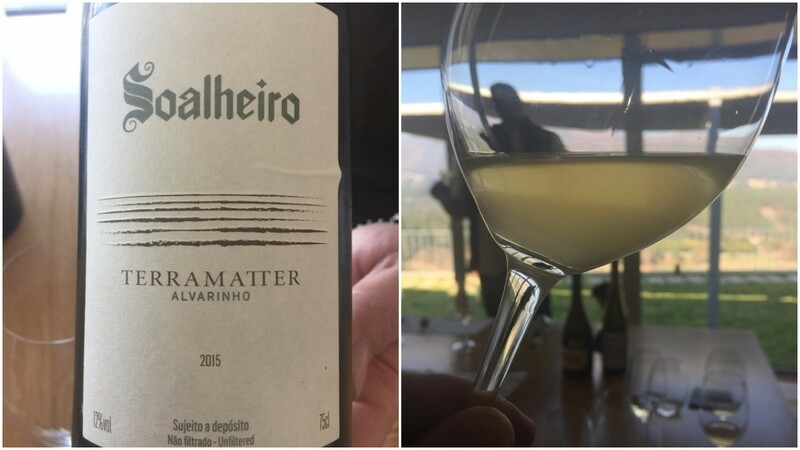 The most recognized wine that Soalheiro makes, the objective of this wine is to balance elegance, intensity and freshness, while at the same time focusing in on the true varietal character of the Alvarinho grape and the reflection of terroir. “Allo” 2016 was next, one of the few wines not entirely Alvarinho as this was 30% Loureiro, maybe the most popular grape grown in the Vinho Verde. Loureiro makes wines that are very dry, elegant, medium to medium(-) in body with high acidity and low alcohol. Blended with the fragrant and slightly fuller Alvarinho results in a lower alcohol wine with more elegance and restraint, quite the nice aperitif or companion to delicate cuisines like sushi or crude. 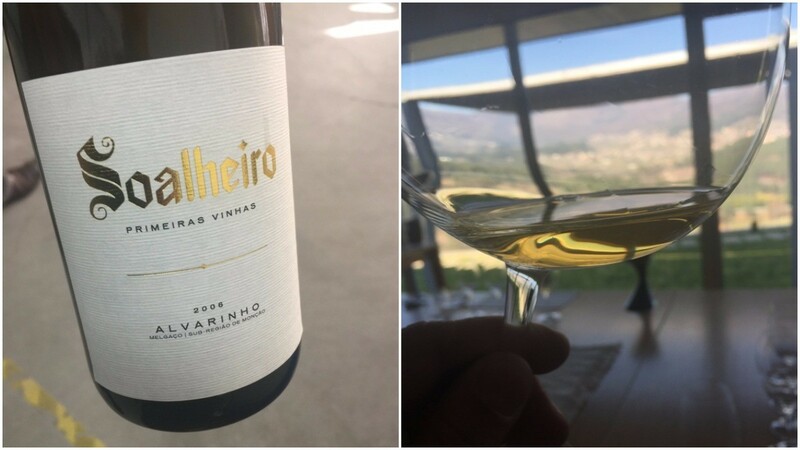 With the Allo, Luis countered with the Alvarinho Soalheiro 9% Dócil 2016, a lightly sweet, basic Alvarinho wine that is partially fermented to 9% abv in steel tanks. The 2006 Premeiras Vinhas, note the gorgeous golden color easily perceptible thanks to the lighting in the tasting room. 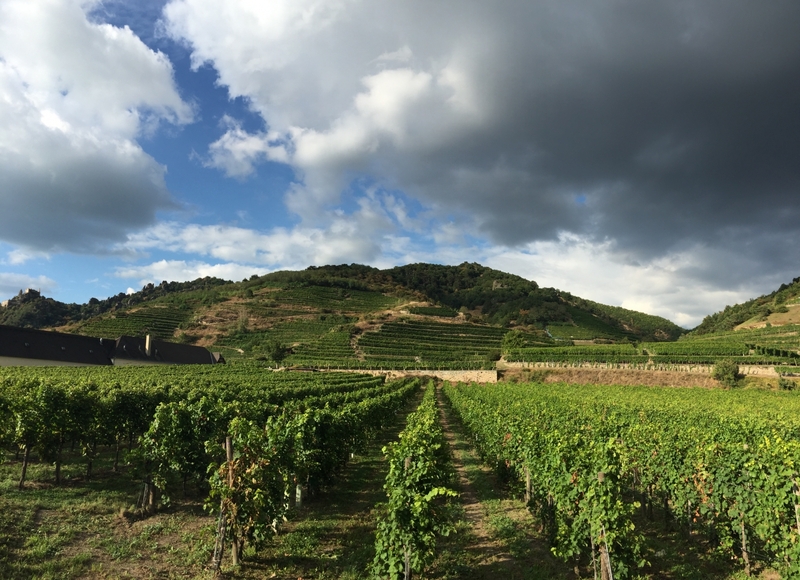 The 2015 Terramatter and its cloudy appearrance. This is normal for a wine that is fermented on its skins in a concrete egg. It made little difference on the palate as the solids were very fine and gave little in the way of texture. The last two wines were to me the most complex and most cerebral of the day, Terramatter 2015 and Granit 2015. Terramatter is made from only organic Alvarinho grapes, fermented entirely in the concrete egg, is bottled unfiltered, and sees further aging in the larger, elongated chestnut barrels. Granit is also entirely Alvarinho from several closely planted small vineyard sites planted at 150 meters of altitude in dense granite soils – the idea is akin to a single vineyard wine. Fermentation of Granit is in steel tank, but at warmer temperatures than the other wines, as Luis has found through experience this helps to bring out more of the mineral expression of Granit from this set of vineyards in these specific granite soils. Batonage and aging on the lees adds further complexity and depth to the wine while it ages before bottling. Having gone through more than half of the portfolio, we moved on to lunch to finish up the portfolio and enjoy some revelry with our hosts and fellow guests. A short drive down the road took us to a set of vineyards in which the middle was a small hospitality house where lunch was served. At lunch we feasted on local cuisine, much of it sourced from their own stable of organically raised pigs. Piquito peppers, prosciutto, salads, multiple kinds of salumi, sausages, roasted vegetables and pork steaks composed a feast of ingredients sourced about 250 feet from the table. We started with a toast of the excellent Soalheiro Espumante Brut Alvarinho 2015. Also made in the traditional Champagne method, this was a stunner and one of my favorites of the day. Personally, I think the sparkling wines from Portugal are great and have a lot of room to grow internationally once they start to gain a foothold and catch on in the marketplace. Not to mention they are generously priced when compared to their French muses. Next, we rolled into the Alvarinho Soalheiro Reserva 2015 and 2014 for comparisons. While this wine ages entirely in oak, it is a careful combination of both old and new French oak to ensure that the oak is noticeable, but does not dominate the character of the wine. 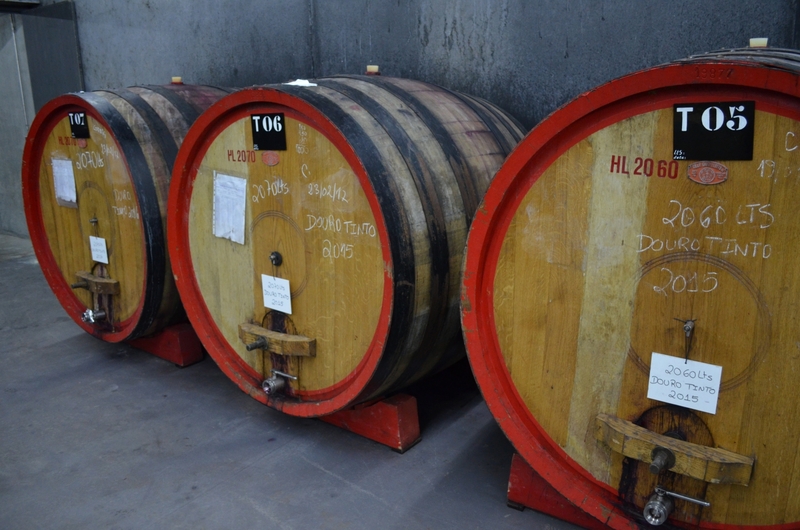 The idea here, as it is with many of the best winemakers that use oak barrique, is to enhance the wine with subtle oak nuances. It is a careful process that aims to lengthen, broaden, deepen and add dimension through oxygen exposure. The Reserva gives the impression of being a wine that is more full bodied and lower in acidity, but in reality it has the highest acidity measurement of the entire portfolio. The body sees some amplification from oxygen and from some wood tannin naturally absorbed into the wine from the barrique. The 2015 was a powerhouse, built to age or even enjoy now, it is intense and medium+ body flows to a long, powerful finish. The 2014 was a great counter, showing the impact of a cooler year on the wine. Also medium+ bodied, the wine showed less density, but more breadth as it was more complex at this stage with a little more perceptible acidity, very refined and elegant. Deserts cakes galore rounded out the meal and included maybe the best chocolate cake I have ever eaten and of course a nip of Soalheiro aguardente made from what else? Alvarinho, of course! Aguardente made from what else? Alvarinho! Some notes on the viticulture and soils. 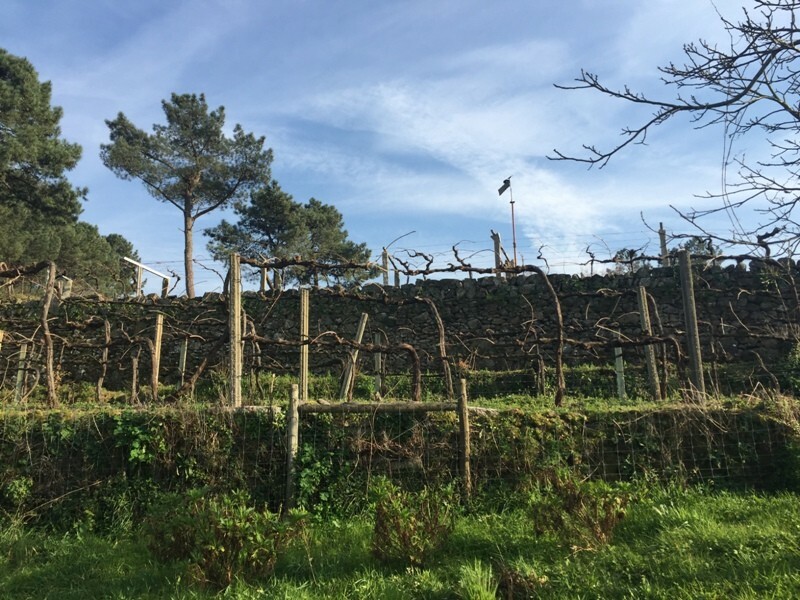 In Galicia over the Minho River in Spain, a popular method for vine style is the Pergola system where vines are trained high to hang off an overhead trellis system. 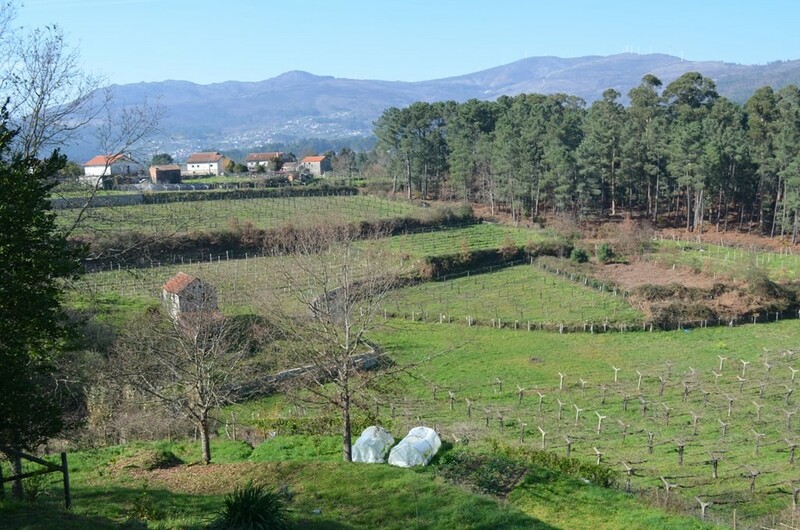 Here in Monção e Melgaço you can see some Pergola vines, but it is not the preferred method and you do not see it often. Here off the back patio after lunch I discussed with Luis what vine systems we were looking at and which ones he prefers for their success. The Cruzeta trellis system is preferred by Luis, and from time to time you see long drawn out vines that look like huge guyot. You also see up in these parts a lot of the posts are made of concrete. 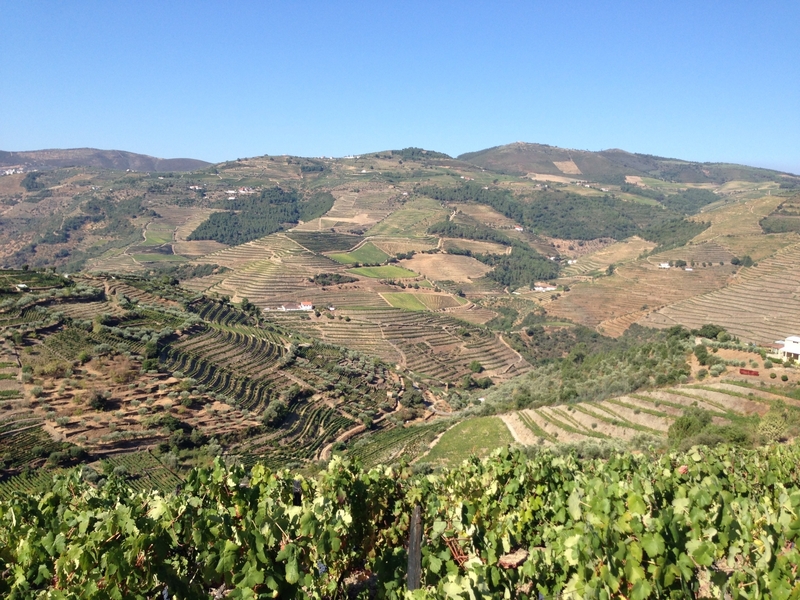 The oldest Soalheiro vines to date are 43 years old while the younger vines are 15. The soils everywhere are a deep granite changing between a reddish-brown brown but primarily and off-white, especially when near the surface and when dry. More vines, note the concrete trellis posts. Patchwork vineyards were seen in every direction, with Spain in the background starting at the foot of those tall mountains. 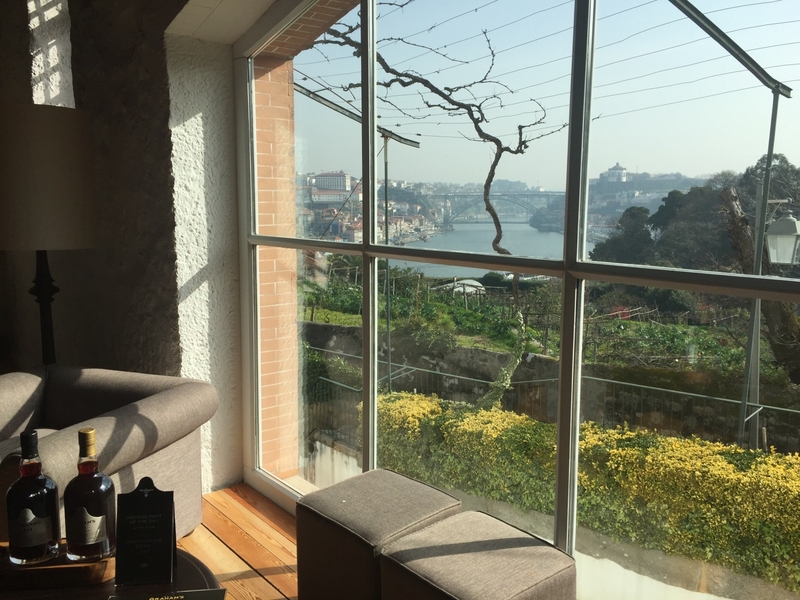 The visit to Soalheiro was invigorating and far exceeded my already high expectations. 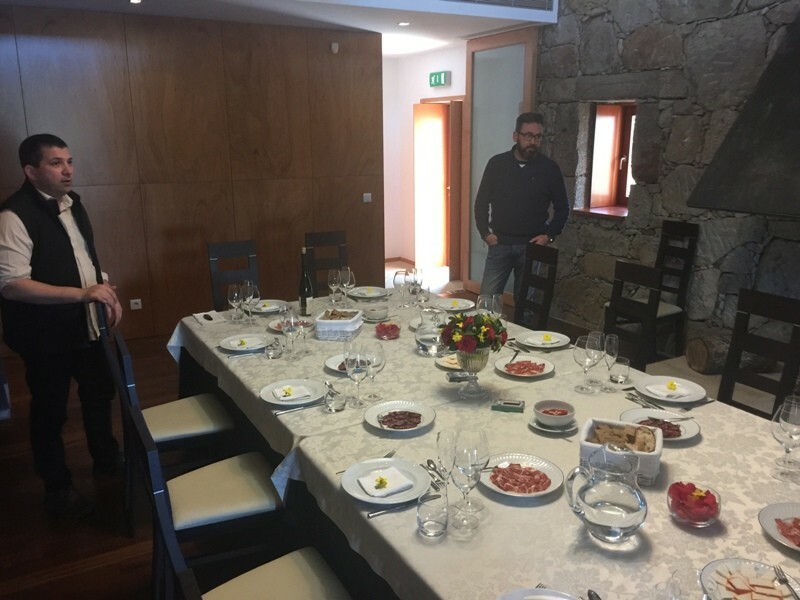 Like many of the top visits I have made to wine producers, this one had it all, the wines of course were exceptional, but more than that the land, the culture, the winemaking philosophy and most importantly the people of Soalheiro who bring it all together. The proof is in the bottle my friends. My favorite VV producer, this is great in-depth reporting here Tom! Obrigado!